Last thing that was missing was his name: 40% voted for Kvothe, so here we go! Looking forward to playing with this guy? This entry was posted in Design, Game Mechanics on January 29, 2015 by Andy. The thing is, i got all the Wizard Levels i need… So the hero is “wasted” on me. But i guess, if i get him i gonna use him once anyway, just to say “I used him”. And thats the problem i see on the Card. It’s only useful for early levels. Once you reach about level 70, the card is quite unproductive. 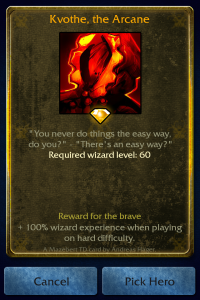 The questions is: Can you implement it in a way, that it got a rather high chance for low level players to roll it, so they can level their Wizard faster? I’m currently just reached level 70 and I’d really appreciate a little experience boost. Still a few skills left I’d like to master completely. 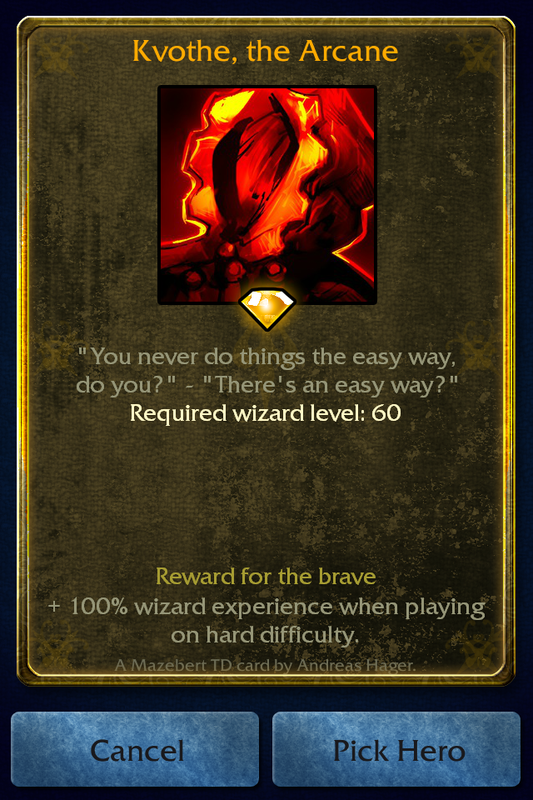 So if I would get this guy at level 60 or so, it would help me a lot 🙂 Also, I made it a high level card, mainly because the way up to level 60 you make quite nice progress. But after you pass this it becomes quite slow.. I also see that right now there could be more motivation to gain higher levels. But maybe this will change when new wizard skills become available in future versions! @Ontrose who can play on hard at lvl 10-20 anyway? its a card for get to high rank not for skills IMO..
Well your comment is there now ^^ bit late but better then never, right? I dont know how balancing is right now, but i made one game on easy and then went on for hard directly afterwards. I like the challange most of the time. I dont really care about my name beeing on the high score for Wiz level. I’m around 77 or so right now and got about all the skills i want to unlock. I just prefer to have a lil speedboost for early or higher dropchance instead of wizard exp. And i think there are more poeple like me, who would agree that boosting wizard exp is much more important on early levels, so you can unlock the skills faster 😉 then getting a high score on the ladder. If the Wizard Levels get reset someday, i will of couse use him. But i dont see that coming right now. At least not before the “Light” Deck is done. Well, im not that much into competetive 😉 though i like CS:GO and stuff like that. It’s just i dont care about the actual ranking that much. Anyway i take the +dropchance most of the time. Right now trying with +AS.